For the origin of the word "Sweden", see Svealand. Sweden at the height of its territorial expansion, following the Treaty of Roskilde in 1658. The map shows Sweden proper in dark green, represented in the Riksdag of the Estates, while the other shades of green stand for different dominions and possessions. Sweden proper (Swedish: Egentliga Sverige) is a term used to distinguish those territories that were fully integrated into the Kingdom of Sweden, as opposed to the dominions and possessions of, or states in union with, Sweden. Specifically this means that from approximately 1155–1156 up to the Treaty of Fredrikshamn in 1809, Sweden proper did also include the bulk of present-day Finland as a fully integrated part of the realm. After 1809 however the use of the term has been to distinguish the western part from former eastern half of the realm, or Sweden from Finland. Skåne, Halland, Blekinge and Bohuslän formerly parts of Denmark and Norway, came under the Swedish Crown by the Treaty of Roskilde in 1658, but it was not until 1719 that it was fully integrated and became part of Sweden proper. Only the estates of the realm of Sweden proper were represented in the Riksdag of the Estates. In Sweden this included the fourth estate, the Peasants. 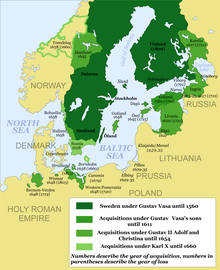 Sweden proper is, as opposed to Finland Proper, a geographical reference that has changed over time, whereas the latter was a province in southwestern Finland that gave its name to all of Finland. ^ Jouko Vahtola (2003), History of Finland, ? ^ Juan Pan-Montojo, Frederik Pedersen (2007). Communities in European history: representations, jurisdictions, conflicts. Edizioni Plus. p. 227. ISBN 88-8492-462-6. This page was last edited on 27 July 2018, at 20:48 (UTC).